The first few weeks here at the hospital after Felix’s diagnosis were hell. Watching every dream I’d ever had for Felix’s childhood crumble, one after the other. But things have been better these last few weeks. Most of all, because he’s been doing so much better. If you can look past the central line in his chest, the feeding tube in his nose, and the fact that he’s in isolation, he seems like a pretty normal and happy baby. We cuddle and play with him. He has favourite toys and favourite ways of being held. He interacts with us and really wants to learn how to crawl. But we’re also adjusting to our new life and our new identities. And it’s not all bad. I’m no longer a crunchy mom. 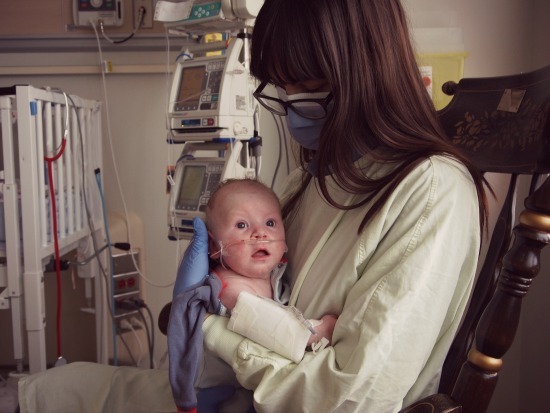 I’m the mother of a hospitalized child with a rare, life-threatening disease. I have no say in what, when, or how my son eats (which, for the record, happens to be 90 mL of Neocate formula, every three hours on the dot, via NG tube), what he wears, or where he sleeps. This was a very difficult adjustment to make, but it’s my reality now. And there’s some liberation in having no say. I don’t bear all the responsibility if something goes wrong. And I can focus my energies on other aspects of his well-being, like making sure he’s getting enough snuggles and exercise. And I’m a part-time caretaker to Lydia now. I’m no longer her entire universe, and she’s no longer mine. That gives me more time for Felix, Ben, and other aspects of my life. It’s painful when I think about it, but don’t cry about it every day any more. I know she’s happy and having lots of fun with her grandparents, aunts and uncles. She has dance parties every day with her Auntie Maggie. She plays outside in the snow with her Uncle Joseph. She got to pet their new calf the day after it was born and she’s making friends with the dogs, especially Arwen. She’s doing great. I’ve even been toying with cutting my hair (like, really cutting it . . . as in pixie short) to reflect this new identity. I’m not the woman I used to be or would have chosen to be. But I’m still an okay person and a good mother. Now that we’ve gotten really settled into our lives at the hospital and Ronald McDonald House, we rarely even think about how weird it all is. We’ve got a routine that involves getting plenty of sleep at night and eating three times a day. We usually manage to get out at least once a day together — usually to a book store or a yarn shop, or to get groceries or lunch. We don’t even have to think about what we’re doing when we “gown up” to enter Felix’s room — it’s natural and automatic now. Every time we go to touch him we sanitize our hands and put on a new pair of gloves. Feeding Felix is almost effortless: opening up the syringes, checking the placement of his NG tube with the stethoscope, and measuring out the formula don’t phase us anymore. It’s just part of our daily routine. My life no longer revolves around food/cooking from scratch, as it used to, but rather around making sure Felix is well and comfortable in his room. We eat to survive — whatever is available. I don’t think about GMO’s or pastured meat or good fats — I just eat what’s there (in the RM House dining room or the hospital cafeteria) and what’s appetizing. It gives me a heck of a lot more time to think about other things. I’ve been able to pick up hobbies and read books I’ve never been able to consider before — like crocheting and fiction. It’s kind of nice to get into these things, honestly. We have no idea what’s ahead for us. We can’t make plans beyond a couple of days in advance because we have no clue what next week will bring. All it takes is another fever or cough or bad blood count to bring everything crashing down again. We don’t know if or when we will ever take our son home (although lately things are looking really positive. Maybe in a month or two!). We don’t know whether he will get into gene therapy (though we had a meeting on Monday and found out we are definitely on the waiting list.) Until recently, we couldn’t even bring too many days’ worth of clothes into his room because we never knew where he’d have an IV in his body (in his foot, his hand, his scalp) so we didn’t know what kind of pajamas he’d be able to wear. All this has forced us to live for the moment. For the first few weeks I felt perpetually sick with worry, thinking about his future. But these days I don’t. I can’t think about his future because I have absolutely no idea what his future holds. It’s a waste of energy to worry about it. I wake up every morning thinking about the day at hand and nothing else. And lately, the days have been looking good. So I focus on that. Over the last few months I have had to come to terms with the fact that I will very likely outlive my son. Whether it’s in a month or a year or twenty, there’s a good chance I will have to say goodbye to my baby before I go. I have always taken it for granted that Lydia will always be there. That she will live a long, healthy, productive life. Of course, there was no way I could actually know that this was true and I still don’t. But I felt like I did. I feel like I have always had a death-grip on her as a result. I CANNOT lose her. I CAN. NOT. But it turns out I don’t necessarily have a choice. This experience with Felix has shown me how little control I have over my children’s lives. And I’m even starting to see that I would be able to survive their loss. It would be horrendous, but survivable. My grip on Felix has been a lot gentler as a result. I love him so much. But I can’t hold him in a death-grip. I have to be prepared to let him go. I will love him the best I can in the meantime, but I can’t force him to stay. It’s a gentler love, in a way. He doesn’t belong to me. I know this now. You are a wonderful mum and an admirable personality, Kathleen. I am so sorry for you all and especially for Felix. I didn’t know much of you and your family except your strong belief in God and your love for Jesus In your last communication I met you as the wonderful human being you are and tears came into my eyes considering that a pure young woman like you, your husband and an innocent child should have to go through such an ordeal. We can only pray, God alone knows the reason, why things happen, and we have to accept it. My heart is with you! What a perfectly, beautifully written response to life. Oh, what a beautiful post. And for the record, you’re much more than an OK person! What you’ve written here Kathy is truth. Gentler love and living in the moment are ways of life that we all should embrace. I say should because we often don’t. I struggle with these as a mom and as a control freak. But you’ve given me another glimpse into your life nowadays, and this leads me to do some reflecting on my own journey. Thank you for your honest words. I’m praying for you this morning. Much love. *tears* As usual, I can’t think of what to say, but I am thinking of you often. I’m glad that some parts are getting easier and I’m so glad that Felix has been doing well the last few (several?) weeks. Will continue keeping you in my thoughts. Thank you for sharing, and helping us understand your journey and also helping us reflect our own lives. Praying for Felix, you Ben and Lydia for strength, healing and life. 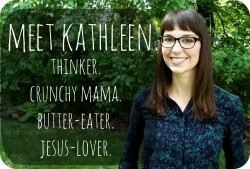 You are a beautiful woman Kathleen! My 6 year old son was diagnosed with a rare form of leukemia in October. Your new reality mirrors ours in SO many ways. I have to spent long periods of time with him in the hospital 2 1/2 hours from home and my other 6 kids. It is outrageously hard, but yet there is good in the midst of it. It has certainly made me realize that we do not control the destiny or health of our children. I am so thankful that God is bigger than any disease and I can relinquish control to Him through all of this! Oh Trish, I am so sorry about your son’s diagnosis. That must be incredibly hard. I hope treatment is successful — I have heard great things about treatment of leukemia these days, though of course it’s horribly difficult. I appreciate your faith and your support. Thank you for sharing this beautiful post. It really reminds me that they truly are only ours to hold for a time, despite how difficult that is to face for any parent and especially I’m sure for someone going through your situation. I know it is a silly thing to comment on, but I cut my hair pixie short after my son was released from the NICU (preemie born at 32 weeks) and remember it being so liberating. I know it is silly but it felt like a part of the process of accepting what had happened and that physical change helped me to come to terms with the change I went through emotionally. I needed to rid myself of something – of the feelings that overwhelmed me during my son’s birth and NICU stay – and the physical shedding of hair seemed to help me. I know our situations are not the same but I thought I’d put that out there in case it helps. Yes! Exactly!! Thank you for understanding the hair thing!! And putting my feelings into words. I don’t think it’s silly at all. Blessings on your day. On Today – On This Very Moment. Thank you for sharing your heart. It certainly challenges me in my own spiritual walk. Your writing has always been so enjoyable and thought-provoking and it continues to be so. Thank you for sharing what you’re going through. Thank you for being honest that sometimes being a crunchy parent/person isn’t the end all be all. And what a beautiful and simple way you have of tending us all that no one is ours and in fact we are not our own. Blessings and hugs to you. Dang autocorrect. Reminding us. Not tending. Thank you for this. I know that it’s totally different, but my father was ill for a long time (7 years) and after he passed, many people said things to me about how I probably preferred to remember him when he was healthy, etc. My mother wanted to display only photos of him healthy. But the thing is, he was a person when he was ill, too, and we lived life within the context of his illness, and had joy and happiness and love within that world. It’s an argument I’ve made many times. The ‘new reality’ of illness is not all bad, just as the ‘new reality’ of something positive (a marriage, a trip to explore a foreign country) is not all good — because either way, it’s still life, and life always has both ups and downs. I’m so glad that you can find some peace. “But it turns out I don’t necessarily have a choice.” <<< the hardest thing to learn EVER. Believe it or not, getting even *close* to understanding that, is a huge gift. Many prayers and Blessings for you all. Oh, and Pixie Cut!! DOOOOOOO EEEEEEETTTT! It’d look super cute on you (altho’ your head will be FREEZING until Spring thaw) and it’s super easy care and you can always grow it back out again when you want a change. Lovely post, Kathleen. So many prayers for your family. I am glad Felix is doing a little better and I hope so much that you get to bring your baby home soon! I love the idea of a haircut! I’ve been going through a rough spot (though nothing like yours, but a major change in my identity and a time of career/economic/future instability) and I’m thinking about getting a tattoo to remember the hope and life and beauty that existed in this stage amidst all the pain and confusion. Your thoughts as you settle into your new life are so rich. Thank you for writing them down. This is so beautiful. I am feeling really convicted. I mother Hudson with a deathgrip, and share the sentiment you once held that my life would not ever go on if I lost him. Brian has called me out on it before a number of times but I just don’t know how to not. I haven’t even wanted to try. But maybe I should try to let go a little. This post is food for thought. Thanks. You’re so much more than an okay person. This post is so eye-opening. Your gift (one of them) is writing. Thank you for sharing your honesty and your pain. Thank you for this. Infertility & the profession of Nursing brought about this life-view for me that you are now experiencing. I really do appreciate it. Thanks for sharing how you also realize that although painful, it is liberating. I’ve just discovered your website. Thank you for sharing your gifts. Jesus bless us both, all, whatever.